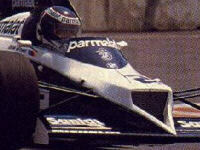 This was Corrado Fabi's last GP in which he claimed his best result (7th) in a much too short F1 career. Teo's kid brother was always regarded as the more talented of the two but sadly those who predicted a bright future in F1 for Corrado were proven to be wide off the mark. His meteoric rise from national racing to European F2 Champion in 1982 bore all the hallmarks of a future World Champion. But a first year in F1 with perennial tail-ender Osella must have shattered Corrado's confidence. Meanwhile, bald and sad-faced Teo was creating a niche for himself in Indycars and at the same time outgunned his brother in the Brabham-BMW they shared in 1984 after dairy giant Parmalat asked for an Italian driver (in the end they got two for the price of one!). Teodorico got to drive the No.2 Brabham twelve times and even finished on the podium in Detroit. Although Teo, the gentlest of men, probably never wanted it to happen he in a way was responsible for the early demise of his brother's career.